When I first started casting a fly rod, my fly selection was pretty sparse. I didn’t even really know that there were fly patterns other than Elk Hair Caddis until I was a teenager. Fishing my home waters in Colorado, I stuck to the standard western trout fare. I swung leeches and wooly buggers, dead drifted nymphs, and skittered the reliable Elk Hair Caddis. 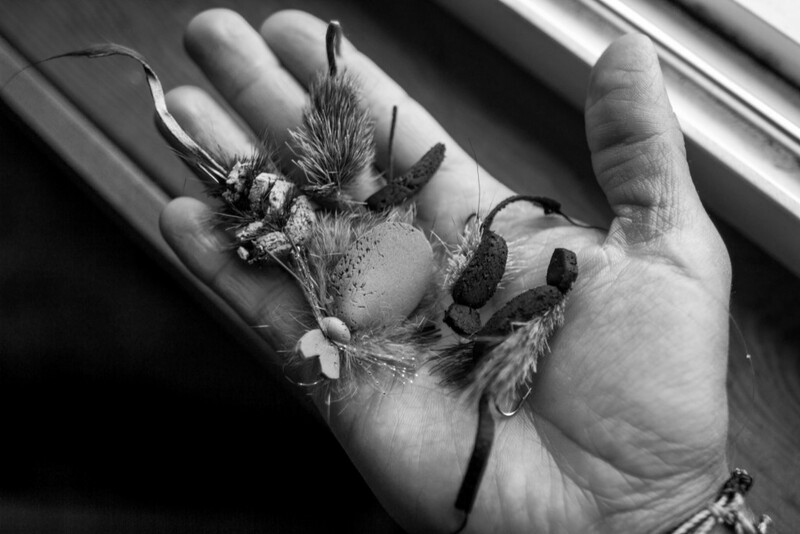 I rarely deviated from the standard formula until I saw a short film about fishing with mice on the South Island in New Zealand. As far as I can remember, that point marks my obsession with fishing for trout with mice. I began by tossing big deer hair mice patterns in the late evening, with little to no success. Colorado is not known as a mouse fishing haven, and whenever I tied on mice patterns, I had to optimistically shrug off sideways looks from my fishing buddies. I can dream right? There’s just something about throwing a huge foam fly imitating a mouse that I couldn’t get past. You slap it on the water and strip it back in, then watch as a shadow appears out of the brush, swimming lightning fast towards your fly like a shark chasing a seal. It smashes into the fly, then retreats. Then smashes again, thinking to stun the mouse before devouring it. You have to wait until you see the real take to set the hook, something that takes an overwhelming amount of self control. Then the trout jaws come out of the water again, swallowing the mouse whole, and bam! Fish on! Its magic. When I began guiding in Alaska, I confess that it was not mice that brought me there. In fact, when I first stepped off the plane in Dillingham, deafened by the roar of propellers and captivated by the NO PEBBLE flags everywhere, swimming mice were far from my mind. I was drawn to Bristol Bay by the promise of solitude in the wilderness. By the thought of untouched salmon rivers meandering their way to the sea. Upon my first flight into the Togiak Refuge, it became immediately clear to me that I had come to the right place. We soared through the post-glacial landscape, picking our way through mountains and flying over uncountable rivers. Every way I looked out of the float plane window, I saw none of the signs of activity I had grown accustomed to in the landscapes of the West. No fences. No parking lots. No roads. Just rivers and lakes with pods of salmon so vast you can see them from a thousand feet in the air. It was soon after the mouse on my back returned to the front of my mind. I was sharing my boat with an angler who loved to fish dry flies, having spent summers fishing in Montana. When he handed me his box and gave me the “what should I use?” look, I grabbed a fat foam mouse and tied it on. I still didn’t hold out much hope, but I hadn’t been fishing in Alaska very long. 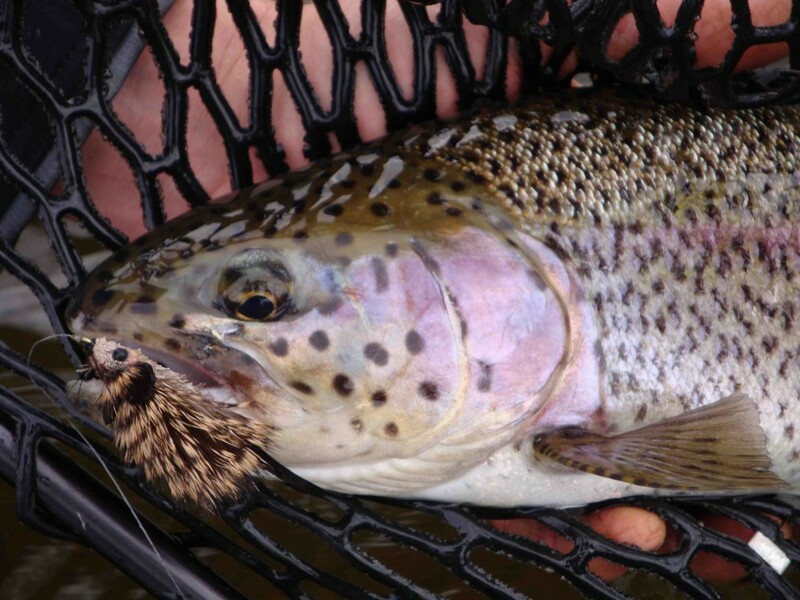 After a few casts at the overgrown bank, a leopard rainbow exploded out of the shadows and crushed the fly. I was honestly shocked. I know now that any Alaska guide will tell you this is no surprise, but I was still new to the region and stared in disbelief. These fish actually eat mice! There are some specific factors that make Western Alaska a mousing haven. For one, it is tough to earn a living as a trout there. The summer days may be long, but the summer is short. 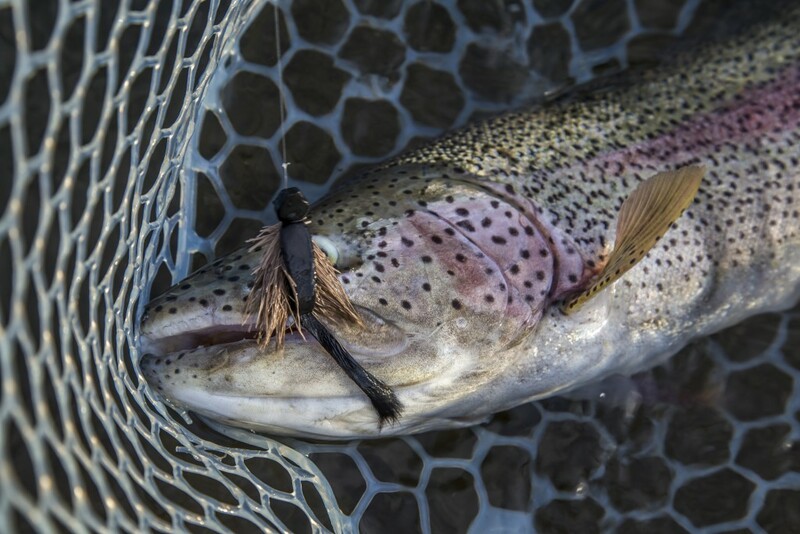 Trout have a small window to eat as much as they can as fast as they can, before summer turns to a long, dark, and cold winter. This makes them ravenous opportunists. Anything that can be eaten, especially something big and full of protein, is well worth the chase for them. Smaller fish, sculpins, salmon fry, salmon eggs, and of course, swimming rodents. In the later summer months, trout tend to stack up behind the endless strings of salmon migrating up the rivers. For reference, Bristol Bay saw a record 59 million sockeye salmon return in 2017. Sockeye are only one the five species of Pacific salmon that call Bristol Bay home. Thats a lot of salmon eggs. The salmon eggs that fill the rivers are undoubtedly the life source for rainbows and Dolly Varden Char, as well as other resident species. They are innumerable and protein rich, so rainbows really key into them when the salmon are in numbers in the river. The longer the season goes on, the more difficult it becomes to get the leopard ‘bows to look up. This is what I have found to be a mouse fishing paradise. A perfect storm of events; long sunny days, hungry post spawn trout, and a lack of food supply competition all lead to one thing. Insane mouse fishing. Trout hide in the undergrowth, and hungrily chase mouse patterns that are slapped on the water near the bank, sometimes returning to attack the same mouse pattern a dozen times. 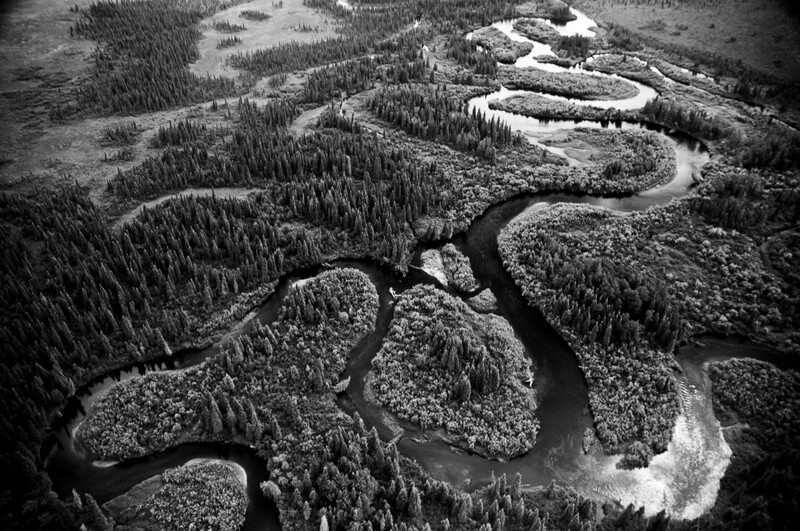 The Kanektok river is well know for this phenomenon, as it has over 100 miles of overgrown banks for its resident ‘bows to hide in. A circulating photo shows a biologist dissecting a Kanektok ‘bow with over a dozen rodents in its stomach. Like I said. Insane. A past guest summed it up for me one evening. He was fishing his way down the bank opposite from camp, casting a favorite foam mouse pattern. I sat on my raft, all the camp chores done for the night, and watched midnight sun glitter on the water as it sank lower in the sky. I heard a splash from downstream, followed by laughter and a yell back up to me, “I’m in a crazy land where fish eat mice!” Another convert to the mouse fishing faith had just been baptized in the waters of western Alaska. I shouted my approval. Prime Western AK Mouse water.